The following Data was compiled from Galactic archives by a fellow historian and data-book writer named Ugavine. A Dalek is composed of two parts. The Dalek Armour, and the Kaled creature that sits inside. Kaleds used to be human but evolved, or mutated, into this blob-like state. Daleks are highly intelligent, even capable of Time Travel and building their own TARDIS. Even when outside their Dalek machines they can be very dangerous. During their evolution into Daleks their emotions of remorse, compassion and love were eradicated, and their aggression heightened. Personality: Daleks are logic in their thought, but ruthlessly aggressive. A Dalek will not think twice before killing in cold blood. To a Dalek the only thing of importance is the preservation and growth of the Dalek Empire. -Stun Gas (6D) up to 10M - area effect iin a 45 degree arc. Other Daleks hit by the blast are unaffected. Characters can only add armor if they're not wearing a breath mask or some other apparatus. -Mainframe computer: Daleks can access aa tactical battle computer. When able to link to the mainframe, Ground and Space tactics are +3D. While encased in their protective Armour Dalek Armour Operation skill is used for any dodges. The Kaled may still be alive and may viciously attack after it's armour is destroyed. These are the 'assimilated' humans and other species that serve the Daleks as slaves. The subject is specially processed, brain patterns erased, and fitted with cyborg technology. A roboman is effectively a zombie. The victim can not be saved so Jedi need not worry about attacking Robomen. In essence they're helping put the victim to rest. Robomen tend to be programmed with a specific task, e.g.. Mining, tracker, guard, computer operator, etc. 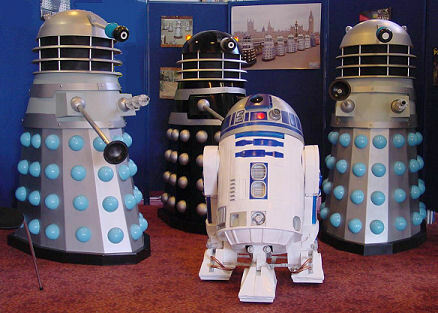 The Daleks choose their Robomen usually from the leaders of a group. A leader is no good as a slave as he could lead the slaves to revolt. By conditioning people into Robomen the Daleks totally brain wipe their victim. The process takes approximately twenty minutes. 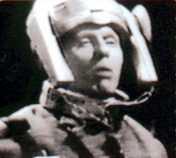 The victim is strapped on a bed with a device attached to their head. The memory wipe can be quite painful, especially if resisted. To resist Memory Wipe a character must make three Willpower rolls (or Control) at each phase of the operation. The phases take effect at 5 minutes, 10 minutes and 20 minutes. These rolls are Easy, Moderate, then Difficult. The operation can be stopped at anytime. Failure on any Willpower roll will take it's toll on a character. 1st phase - Willpower: Easy: Choose a skill at Random. This skills is lost, and falls back to the Attribute default. If the skill had not been increased the character was lucky. 3rd phase - Willpower: Difficult: Character is totally mind-wiped and is lost. The most important roll is the third. If the character fails the third roll they are lost, and become a Roboman. Only success on the third roll will prevent the mind-wipe. If the Daleks discover that the mind-wipe has failed they will EXTERMINATE them immediately. The only time that the Mutt Squad ever encountered a Dalek was in a bar on the outer most fringes of the known universe, the Dalek was a trophy standing on display in a Plexiglas case. No one was sure what to make of it and when asked all the Bartender would say was 'The little bastards landed one day and came out shooting, we returned fire and then fled up a flight of stairs. Things went well from then on out because evidently they couldn't transverse stairs on their little treed like wheels. That's when we massacred the whole lot of them!" Shortly there after the Mutt Squad fled the bar without paying the bar tab and rumor has it that the Dalek was re-activated with the mission of hunting down the Mutt Squad for the unpaid Bar tab..